In today's world, our most precious pursuit of a life well lived gets squeezed out by the silliest of things: bringing on Netflix or ice cream, shopping trips for things we don't need, bad habits we can't seem to get a handle on, and so much more. Valerie has been there despite knowing what she wanted for her life. Actually do it? That's the challenge. After gobbling up all the non-fiction and self-help books her donut-filled belly could handle, she decided it was time to put her knowledge to good use and start actually living it out. You will hear about her journey through victories and plenty of failures and find practical tips to apply to your own pursuit of holiness. You will find homework at the end of each chapter that includes a worksheet to put real change in motion for your own life as well as recommended books to further study those topics that really test you. 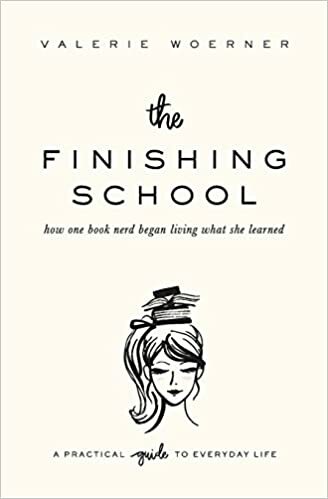 I am SO glad I read "The Finishing School"! This book covered so many different areas that I need to work on. I love that Valerie Woerner suggests that you take your time to work through it, so that you can effectively put it into action. I learned so much while reading it.